Chemical engineering Associate Professor Katie Dongmei Li-Oakey discusses her research and business plans with College of Business Assistant Professor of Entrepreneurship Matthew Fox. The Wyoming Technology Transfer and Research Products Center helps promote and protect intellectual property with market potential. Before Department of Chemical Engineering Associate Professor Katie Dongmei Li-Oakey came to the University of Wyoming, she worked in industry, including as a senior process engineer and team leader of the 193 nm photolithography module at Intel and in new product development for successful startups. “I’ve been involved in product design, prototyping and high-volume manufacturing for companies ranging from startups to the Fortune 100,” she says. Since coming to UW, she has not stopped innovating. “My group and I work on nanomaterials with applications in energy, water treatment and health care,” she says. That work led her to seek assistance from the Wyoming Technology Transfer and Research Products Center. Ideas for patentable inventions and copyrightable materials are often conceived during research conducted at UW. The Wyoming Technology Transfer and Research Products Center’s mission is to help ensure that those inventions and materials are used for the public good through patent and copyright licenses. The center also provides service to faculty, students and citizens in technology transfer processes. In 2017, 72 files were patented with the center’s help, 160 intellectual agreements were signed, and there were 144 total new invention disclosures. Li-Oakey’s current startup is called TLS Materials LLC. Her motivation for starting the company came when a top player in the area of one of her intellectual property patents reached out for a large quantity of materials used for electrical catalysis in PEM (polymer electrolyte membrane) fuel-cell cars. Toyota, Hyundai, Honda and Nikola are all selling PEM fuel-cell vehicles. 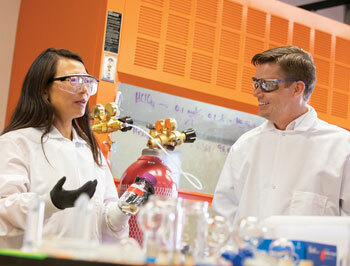 One of TLS Materials’ goals is to make such catalysts more affordable without compromising durability. “That’s one of the technologies upon which I worked with the tech transfer center,” Li-Oakey says. Another top player in the industry is also interested in these materials. She hopes to create a strategic partnership with a large company to grow her technology. Li-Oakey’s research group currently includes six graduate students, two postdoctoral researchers and five undergraduates. One Ph.D. and two master’s students recently graduated. In addition to working with the Wyoming Technology Transfer and Research Products Center, Li-Oakey is working with the Wyoming Small Business Development Center’s Small Business Innovative Research (SBIR) program to pursue a Department of Energy grant. Li-Oakey believes Wyoming’s access to internet and transportation infrastructure—among other things—gives it a geographic advantage for manufacturing. In addition, the university provides a trained workforce. “We have quality graduates from all different disciplines,” she says. Don Jarvis, Department of Molecular Biology professor and president of the university spin-out biotechnology company GlycoBac LLC, has worked with the Wyoming Technology Transfer and Research Products Center on more than a dozen patents over the years. For example, GlycoBac recently partnered with MilliporeSigma, a multinational conglomerate and subsidiary company to Merck KGaA in Germany, to offer a rhabdovirus-free insect platform for viral vaccines and gene therapy development. For the past 30 years, including more than 20 at UW, Jarvis’ basic research has focused on developing insect virus/insect cell systems for recombinant protein production. Jarvis spun out GlycoBac in June 2011 after his student, Christoph Geisler, won UW’s John P. Ellbogen $30K (now $50K) Entrepreneurship Competition. Although an expert in molecular biology, Jarvis has no formal business education or training, and so he also finds WTBC’s business education programming helpful. GlycoBac is currently working on a couple of exciting projects. “We are working on enhancing the functions of HIV-specific therapeutic antibodies for use in recently infected people,” Jarvis says. The research also has applications for many other vaccines and antibodies, as well as other biologics. “I’m excited about our progress, and I think GlycoBac is on the cusp of some really cool things,” Jarvis says. Jarvis and Li-Oakey are just two examples of the faculty, staff, students and entrepreneurs who use the expertise of the Wyoming Technology Transfer and Research Products Center. In October, patent attorney Henry Nowak joined UW as the new director of technology transfer and business resources. Nowak and his team will provide guidance and resources to help individuals identify, promote and protect intellectual property with market potential. The center’s work plays a key role in UW’s plans for enhanced entrepreneurship and tech transfer. “I will look at where are we now, what kinds of things can we do better and what kinds of things we can add to make sure that we’re addressing various stakeholder needs,” Nowak says of his plans for the center.